Quixolabs provides predictive studies of blood–brain barrier penetration and potential CNS Drug-Drug Interactions by using unique models. The combination of the brain–barrier permeability and the free fraction in the brain in early drug discovery is useful for rank-ordering CNS compounds and is more appropriate to correlate with free drug concentrations than either property alone. Measuring the free fraction becomes important when the lipophilicity of the compounds increases, and permeability is an important factor for compounds characterized by low brain tissue binding, i.e., high free fraction. The uptake rate is measured after 15 minutes of exposure. A surrogate marker for extent concentrations in the brain is measured after 45 minutes. 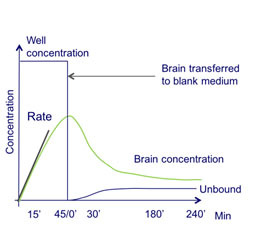 The free fraction in the brain is measured by transferring the ex vivo brain after 45 minutes to a well without compound. After additional 240 minutes the compound concentration in the well is measured, at this time-point equilibrium between the free fraction in the brain and in the solution is reached. The ex vivo model based on the desert locust, Schistocerca gregaria, combine blood–brain barrier penetration (BBB), transporter activities, drug metabolism, and fraction of unbound drug concentrations in one ex vivo model. Around 60 known drugs from different pharmacological classes with diverse physicochemical profiles have been used as reference compounds to validate the locust model to determine BBB permeability. The locust brain barrier model is predictive and differentiate CNS drugs from peripheral acting drugs. In addition, due to the controlled exposure conditions the locust model is able to rank-order CNS compounds. The locust model has shown to be more predictive than BBB in vitro assays. Thus, without compromising science and ethics, the model provides an alternative to rodent studies in the initial phases of drug discovery where numerous compounds are evaluated. Quixolabs has continuously improved the permeability model and in a basic set-up it is paired with assessment of fraction of free drug in the brain. Moreover, depending on the model set-up it is possible to extract additional information (e.g., active transport, metabolism, and metabolite ID) and thereby qualify and prioritize compounds at another level compared with other in vitro and locust models. The unbound fraction can be determined when equilibrium across the brain barrier is reached. The locust brain is designed for compensating for the absence of a vascular system, with a small size but relatively large surface of (1.5 × 1.5 × 0.7 mm) with tracheoles (blind ended tubes). The insect brain is enclosed within an intact brain barrier after dissection, resembling a compressed golf ball. This allows the model to be used with in vitro–like exposure conditions. Such setup provides measurements of central parameters, which are directly comparable between chemical compounds making it useful for optimization. In this way the insect brain models are unique compared to mammals where several peripheral parameters impact the measured central parameters. Studies on the function of brain CYPs are challenging for several reasons. In the whole organism, CYPs in the periphery produce many of the same metabolites as those in the brain, and many of these metabolites can cross the blood–brain barrier (BBB) from the periphery, which makes the relative contributions of hepatic and brain metabolism in vivo difficult to study. Co-administration of CYP inhibitors with the drugs allows investigation of the metabolite formation and drug-drug interactions. Clozapine was analyzed, and its major metabolites, clozapine N-oxide (CNO) and N-desmethylclozapine (NDMC), were identified and quantified. 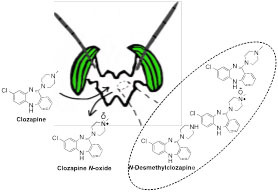 The back-transformation of CNO into clozapine observed in humans was also observed in locusts. In addition, risperidone, citalopram, fluoxetine, and haloperidol were studied, and one pre-selected metabolite for each drug was analyzed, identified, and quantified. 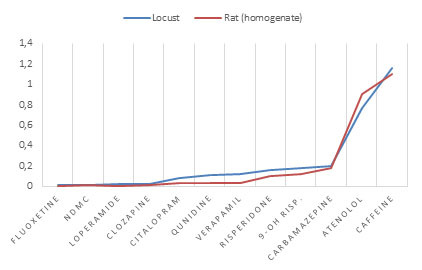 Metabolite identification studies of clozapine and midazolam showed that the locust brain was highly metabolically active, and 18 and 14 metabolites, respectively, were identified. In addition, co-administration of drugs with verapamil or fluvoxamine was performed to evaluate drug–drug interactions in all set-ups.